Does the thought of jumping out of an airplane make you a little nervous? 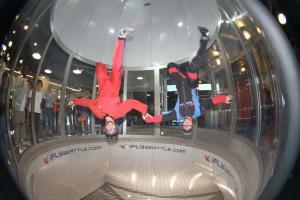 If you like adventure but prefer the safer route, check out iFLY Indoor Skydiving! Be sure to call ahead to make reservations because some time slots can fill up quickly, especially the weekend. 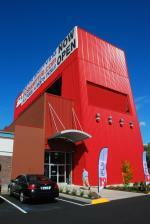 Just across the street from Westfield Southcenter, iFLY, the huge red building, is hard to miss. I arrived an hour before my flight to complete the waiver and enter all of my information in the check-in area and to allow plenty of time to change and get my pre-flight instructions. After being dismissed to pre-flight status, I climbed the stairs and watched the group before me finish up in the wind tunnel. Then, I heard my flight instructor calling my name and requesting me to join the group in the flight training room to watch the pre-flight safety video. We learned how to hold our bodies so we could maintain flight and the hand signals from the instructor to adjust positioning once inside the chamber. When it was time to suit up, I was given a jumpsuit to wear over my clothes, goggles, helmet and sneakers (because I had worn slip -on shoes). Once I grabbed my earplugs I was ready to go and looking pretty good, if I do say so myself! When it was my turn, I was a little nervous but as I approached the entrance I placed my arms over my chest and fell forward just as I was taught. I was immediately lifted by the wind and my instructor positioned my in the middle of the tunnel and gestured at me to straighten my legs. I was flying! Each flight is 60 seconds long and my flight package included 2 flights. I spun around a few times, posed for the camera, lost my balance once and bumped into the glass - but it didn&apos;t hurt, that&apos;s what the helmet is for! At the beginning of the session you have the option to purchase add-ons to your flight package including extra flights or a trip to the top of the tunnel with an instructor. I signed up for the latter and it was totally worth it!. 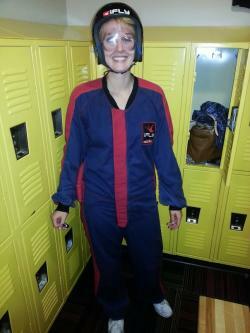 On my last flight, the instructor grabbed the handles on my suit and flew me to the top and spun me around. it was amazing how fast we went but I felt safe and in control the entire time. When all the fliers in my group took completed their final flight, our instructor jumped into the chamber and put on a show for us. Since it was all our first times, we were only allowed to do the belly down position but once you become more advanced, like the instructor, you move up to sitting, back down and even upside down! It was awesome to watch him fly around super fast and do all sorts of tricks. When it was all over I untangled my hair, grabbed my belongings from the locker, changed out of my suit, thanked my instructor and walked downstairs. After the flight you have the option to buy the video of your flight and photos as well. You can view all your photos on TVs in the lobby area on your way out. I really enjoyed the entire experience and didn&apos;t want the flights to be over because it was so exhilarating! I can&apos;t wait to try it again! iFLY is an indoor skydiving experience that creates true free fall conditions, just like skydiving, without having to jump out of an airplane. 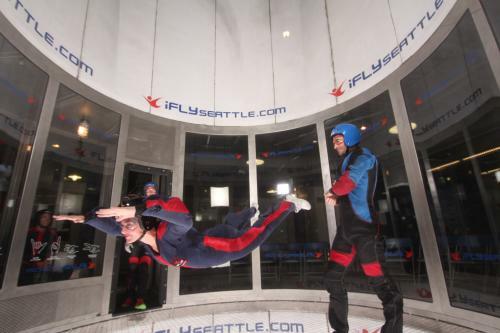 iFLY Seattle&apos;s vertical wind tunnel generates wind speeds of up to 160mph, creating a wall-to-wall cushion of air on which you safely float. No experience is necessary. Just about anyone can fly, including those with physical disabilities. Children as young as three, to adults as young as 103 have flown. There are only a few exceptions—for example, if you’ve dislocated a shoulder or have had a neck injury. More Info on flying restrictions.